I’m a bit behind at the moment, but I’m slowly catching up! On Sunday 17th April I was scrolling through Facebook and I saw one of those ‘how to make…’ videos that seem to be very popular at the moment. This one was for stacked brownies so I watched it and thought ‘I want to eat one of those’. Sadly of course (?!) this means actually making a whole tray. What a shame! So I sat for the 10 minutes and wrote the recipe down, and here it is, for your delectation! Start making the brownies by melting the butter and dark chocolate together. I do this by placing it in a bowl over a gently simmering pan of water. Seive and combine the flour and cocoa powder, add the chocolate chunks and stir round. Break the eggs into a bowl and combine the whites and yolks. Add the sugar and mix until completely combined. Add the melted chocolate/butter mix to the sugar/egg mix and gently stir/fold together. Bake for 35-45 mins, checking until you think the mix almost cooked through – brownies are supposed to be moist and squidgy, so sticking in a skewer or similar should result in some mix still sticking. Remove from the oven and put enough marshmallows on top to cover the brownie. Pop back in the oven for about another 5 mins, or until the marshmallows have melted. Take out of the oven and leave to one side to cool. 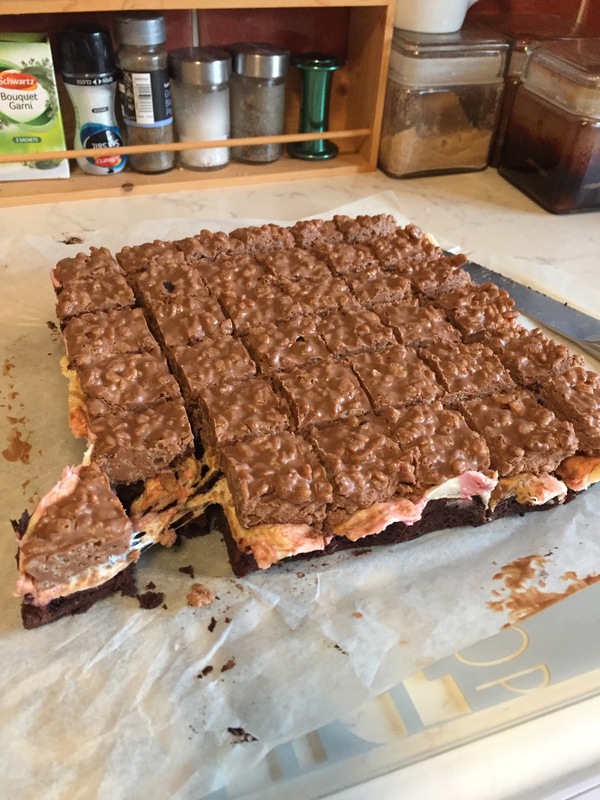 Put krispie mix on top of the brownie/marshmallow and spread out until it’s all well covered. Refrigerate for a few hours – until the krispie has solidified. Voila, you have what is almost some kind of Double Decker in brownie form. I cut them quite small because I figured that they’d be a pretty hefty bite, and I was right. Each of these squares was about 3 mouthfuls. There was so many I took half of them to work, where they were very well received! I might use more peanut butter next time though, as I do like it quite a bit! Omgg look at the gooey cake yumm!